Do I wear a saree or a salwar kurta? This sartorial dilemma is faced by many ethnic-wearing Indian women today. Frankly, for a textile designer like me who makes a living designing (mainly) sarees, even raising the issue is sacrilege. Many Bengal handloom saree weavers I count among friends have suggested just that. The handloom saree is a marvel of weaving, generally available at ridiculously low prices. If you saw first hand how painstakingly Indian handloom weavers conjure up intricate designs and motifs in six yards of sheer magic, you would feel apologetic the next time you haggle for a bargain. Of course, no woman anywhere, except the beautiful Indian woman, can carry off six yards of cloth draped around her with such unbelievable grace. And such grace is not limited to the urbane fashionista; the rustic belle looks at least as attractive in a saree. But times, they are a changin’, no doubt about that. Even twenty years back ethnic-wearing women in this part of the world (Eastern India) would rather be dead than be seen in anything but a saree. But these days more and more young women are venturing out in salwar kurta. So what’s with the salwar – kurta vis-à-vis the saree? The saree can be unintentionally revealing. You wouldn’t want to have a horde of boorish men ogle at your body in public transport, offices and so on. On the other hand, if you want to wear revealing clothes, both sarees and salwar kurtas offer ample opportunities. So salwar kurtas give you greater choice. It’s easier to run around and be of some help with daily chores in a salwar kurta than in a saree. Salwar kurtas don’t start slipping off just when you are precariously balancing a couple of glass jars in either hand. The salwar kurta is easier to wash and/or iron. You’d wish you were wearing the salwar kurta if you get caught up in the monsoon slush: lifting up your saree to waddle through makes an ugly sight. On the other hand, you don’t have to worry about the ‘cut’ when you wear a saree. In the beauty stakes, the saree comes out a clear winner. 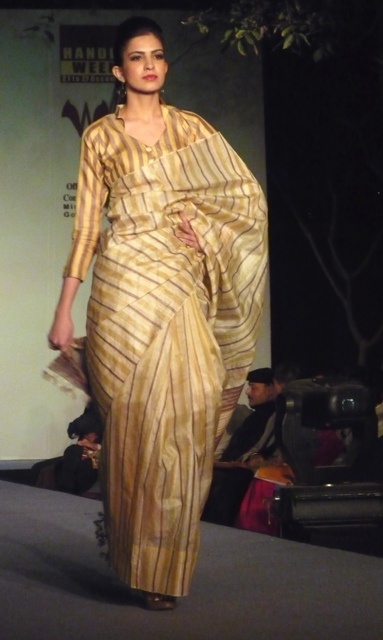 There is hardly any doubt that the Indian handloom saree is what gives our women their distinct sartorial identity. But you have to pay a price, in terms of movement restrictions and maintenance. Ultimately, that might be the clinching factor for millions of working women to switch over to the salwar kurta. As far as social occasions are concerned, it is still difficult to visualize the handloom saree giving any leeway to the salwar kurta. Think you have something to add? Feel free to comment! Enter your email address to receive notifications of new articles by email.